Three-phase electrical power is a critical technology for heavy machinery. 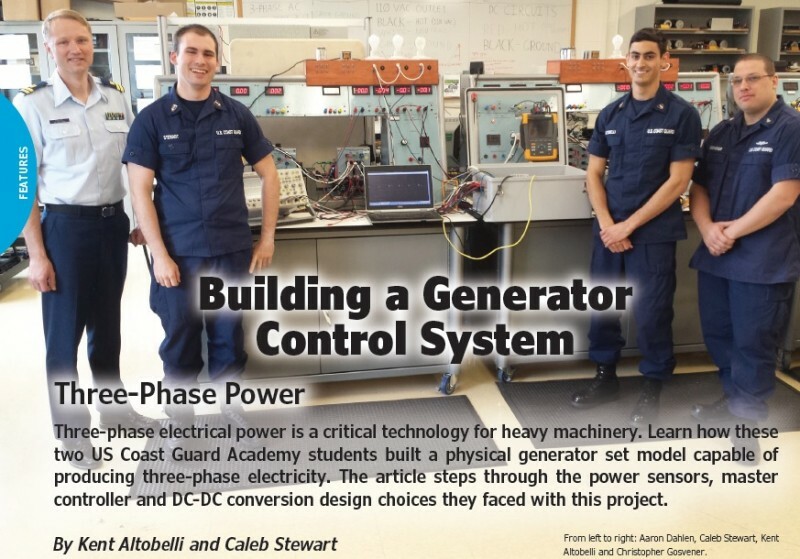 Learn how these two US Coast Guard Academy students built a physical generator set model capable of producing three-phase electricity. The article steps through the power sensors, master controller and DC-DC conversion design choices they faced with this project. (Caption for lead image: From left to right: Aaron Dahlen, Caleb Stewart, Kent Altobelli and Christopher Gosvener.). Three-phase electrical power is typically used by heavy machinery due to its constant power transfer, and is used on board US Coast Guard cutters to power shipboard systems while at sea. In most applications, electrical power is generated by using a prime mover such as a diesel engine, steam turbine or water turbine to drive the shaft of a synchronous generator mechanically. The generator converts mechanical power to electrical power by using a field coil (electromagnet) on its spinning rotor to induce a changing current in its stationary stator coils. The flow of electrons in the stator coils is then distributed by conductors to energize various systems, such as lights, computers or pumps. If more electrical power is required by the facility, more mechanical power is needed to drive the generator, so more fuel, steam or water is fed to the prime mover. Together, the prime mover and the generator are referred to as a generator set “genset”. Because the load expects a specific voltage and frequency for normal operation, the genset must regulate its output using a combination of its throttle setting and rotor field strength. When a real load, such as a light bulb, is switched on, it consumes more real power from the electrical distribution bus, and the load physically slows down the genset, reducing the output frequency and voltage. The shaft rotational speed determines the number of times per second the rotor’s magnetic field sweeps past the stator coils, and determines the frequency of the sinusoidal output. Increasing the throttle returns the frequency and voltage to their setpoints. When a partially reactive load—for example, an induction motor—is switched on, it consumes real power, but also adds a complex component called “reactive power.” This causes a voltage change due to the way a generator produces the demanded phase offset between supplied voltage and current. An inductive load, common in industrial settings, causes the voltage output to sag, whereas a capacitive load causes the voltage to rise. Voltage induced in the stator is controlled by changing the strength of the rotor’s electromagnetic field that sweeps past the stator coils in accordance with Faraday’s Law of inductance. Increasing the voltage supply to the rotor’s electromagnet increases the magnetic field and brings the voltage back up to its setpoint. 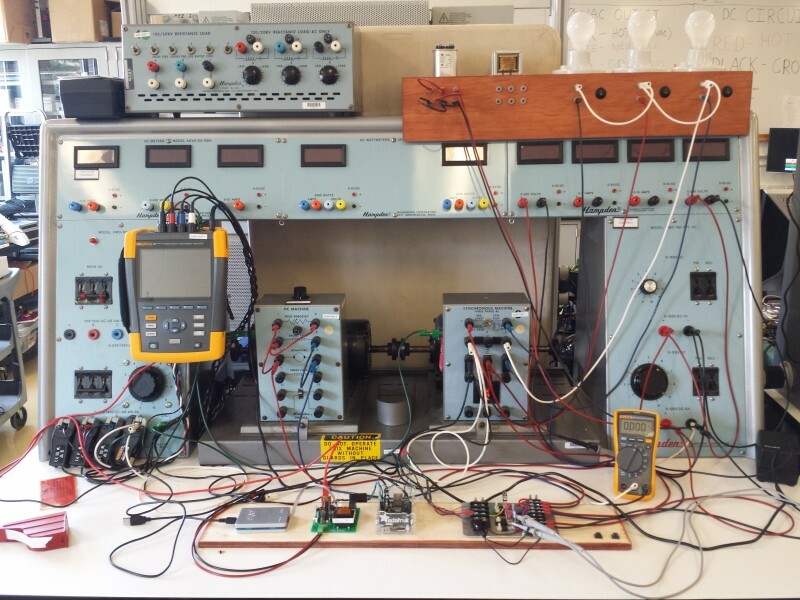 The objective of our project was to build a physical generator set model capable of producing three-phase electricity, and maintain each “Y”-connected phase at an output voltage of 120 ±5 V RMS (AC) and frequency of 60 ±0.5 Hz. When the load on the system changes, provided the system is not pushed beyond its operating limits, the control system should be capable of returning the output to the acceptable voltage and frequency ranges within 3 seconds. When controlling multiple gensets paralleled in island operation, the distributed system should be able to meet the same voltage and frequency requirements, while simultaneously balancing the real and reactive power from all online gensets. Gensets supply power in two conceptually different configurations: “island” operation with stand-alone or paralleled (electrically connected) gensets, or gensets paralleled to an “infinite” bus.” In island operation, the entire electrical bus is relatively small—either one genset or a small number of total gensets—so any changes made by one genset directly affects the voltage and frequency of the electrical bus. When paralleled to an infinite bus such as the power grid, the bus is too powerful for a single genset to change the voltage or frequency. Coast Guard cutters use gensets in island operation, so that is the focus of this article. When in island operation, deciding how much to compensate for a voltage or frequency change is accomplished using either droop or isochronous (iso) control. Droop control uses a proportional response to reduce error between the genset output and the desired setpoint. For example, if the frequency of the output drops, then the throttle of the prime mover is opened correspondingly to generate more power and raise the frequency back up. Since a proportional response cannot ever achieve the setpoint when loaded (a certain amount of constant error is required to keep the throttle open), the output frequency tends to decrease linearly with an increase in power output. A no-load to full-load droop of 2.4 Hz is typical for a generator in the United States, but this can usually be adjusted by the user. Frequency control typically uses a mechanical governor to provide the proportional throttle response to meet real power demand. Voltage control typically uses an automatic voltage regulator (AVR) to manipulate the field coil strength to meet reactive power demand. Isochronous mode is more challenging, because it always works to return the genset output to the setpoint. Maintaining zero error on the output usually requires some combination of a proportional response to compensate for load fluctuation quickly, and also a long-term fine-tuning compensation to ensure the steady-state output achieves the setpoint. If two or more gensets are paralleled, the combined load is supplied by the combined power output of the gensets. As before, maintaining the expected operating voltage and frequency is the first priority, but with multiple gensets, careful changes to the throttle and field can also redistribute the real and reactive power to meet real and reactive power demand efficiently. If the average throttle or field setting is increased, then the overall bus frequency or voltage, respectively, also increases. If the average throttle or field setting stays the same while two gensets adjust their settings in opposite directions, the frequency or voltage stay the same, but the genset that increased their throttle or field provides a greater portion of the real or reactive power. Redistribution is important because it allows gensets to produce real power at peak efficiency and share reactive power evenly, because excessive reactive power generation derates the generator. Reactive currents flowing through the windings cause heat without producing real, useful power. 1) The oncoming generator should have the same or a slightly higher voltage than the bus. 2) The oncoming generator should have the same or a slightly higher frequency than the bus. 3) The phase angles need to match. For example, the oncoming generator “A” phase needs to be at 0 degrees when the bus “A” phase is at 0 degrees. 4) The phase sequences need to be the same. For example, A-B-C for the oncoming generator needs to match the A-B-C phase sequence of the bus. 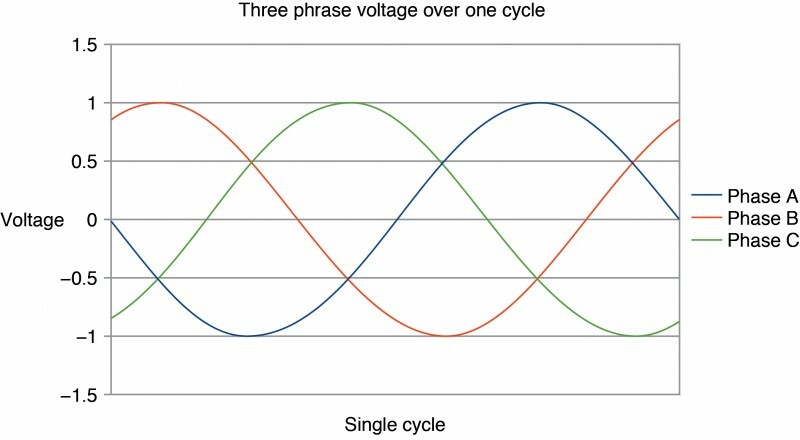 Meeting these conditions can be visualized using Figure 1, which shows a time vs. voltage representation of an arbitrary, balanced three-phase signal. The bus and the generator each have their own corresponding plots resembling Figure 1, and the two should only be electrically connected if both plots line up and therefore satisfy the four conditions listed above. If done properly, closing the breaker will be anticlimactic, and the gensets will happily find a new equilibrium. The gensets should be adjusted immediately to ensure the load is split evenly between gensets. If there is an electrical mismatch, the generator will instantly attempt to align its electrical phase with the bus, bringing the prime mover along for a wild ride and potentially causing physical damage—in addition to making a loud BANG! Idaho National Laboratories demonstrated the physical damage caused by electrical mismatch in its 2007 Aurora Generator Test. Three primary setups for parallel genset operation are discussed here: droop-droop, isochronous-droop, and isochronous-isochronous. The simplest mode of parallel operation between two or more gensets is a droop-droop mode, where both gensets are in droop mode and collectively find a new equilibrium frequency and voltage according to the real and reactive power demands of the load. Isochronous-droop (iso-droop) mode is slightly more complex, where one genset is in droop mode and the other is in iso mode. The iso genset always provides the power required to maintain a specific voltage and frequency, and the droop genset produces a constant real power corresponding to that one point on its droop curve. Because the iso genset works more or less depending on the load, it is also termed the “swing” generator. Finally, isochronous-isochronous (iso-iso) is the most complex. In iso-iso mode, both gensets attempt to maintain the specified output voltage and frequency. While this sounds ideal, this mode has the potential for instability during transient loading, because individual genset control systems may not be able to differentiate between a change in load and a change in the other genset’s power output. Iso-iso mode usually requires direct communication or a higher level controller to monitor both gensets, so they respond to load changes without fighting each other. With no external communication, one genset could end up supplying the majority of the power to the load while the second genset is idling, seeing no need to contribute because the bus voltage and frequency are spot on! At some point one genset could even resist the other genset, consuming real power and causing the generator to “motor” the prime mover. Unchecked, this condition will damage prime movers, so a reverse power relay is usually in place to trip the genset offline, leaving only one genset to supply the entire load. Each genset simulated on the Hampden Training Bench had a custom sensor monitoring the generator voltage, current, and frequency output, a small computer running control calculations and a pair of DC-to-DC converters to close the control loop on the generator’s rotational velocity and field strength. The genset was simulated by coupling a 330 W brushed DC motor acting as the prime mover to a four-pole 330 W synchronous generator (Figure 2). Our power sensor was a custom-designed circuit board with an 8-bit microcontroller (MCU) employed to sample the genset output continuously and provide RMS voltage, RMS current, real power, reactive power, and frequency upon request. The control system ran on a Linux computer with custom software designed to poll the sensor for data, calculate the appropriate control response to return the system to the set point and generate corresponding pulse width modulated (PWM) outputs. Finally, the PWM outputs controlled the DC-to-DC converter to step down the DC supply voltage to drive the prime mover and energize the generator field coil. The component relationships are shown in Figure 3, where the diesel engine in a typical genset was replaced by our DC motor. Since this project was a continuation of a previous year of work by Elise Sako and Jasper Campbell, several lessons were learned that required the system be redesigned from the ground up. One of the largest design constraint from the previous year was the decision to use a variable frequency drive (VFD) to drive an induction motor as the prime mover. While this solution is acceptable, it introduces inherent delay in the control loop, because the VFD is designed to execute commands as smoothly but not necessarily as quickly as possible. Another design constraint was the decision to power the generator field coil using DC regulated by an off-the-shelf silicon controller rectifier (SCR) chopper. Again, while this is an acceptable solution, the system output suffered from the SCR’s slow response time (refresh rate is limited to the AC supply frequency), and voltage output regulation was non-ideal (capacitor voltage refresh again limited by the frequency of the AC supply).